Hi folks! I've been reading through the various guides/FAQs available on using the editor and they're great. One or two are slightly out of date but the principle remains the same. However, I did feel there was a bit of a hole that needed filling, and that hole is shaped like a big 'example'. I therefore thought it might be useful to some people if I talked you through how I would use the editor to turn FM into my own personal fantasy playground (well, football wise anyway). This is very much geared towards people who have never used the editor before, so please don’t take offence if you find it patronisingly simple! I have an idea that there a substantial group of people who love FM but don’t touch the Editor because they believe it to be beyond them technically. Trust me, it’s easy! If you can work your way around the interface of FM then trying things out in the Editor is a walk in the park. Some of you may want to just alter some basic things like a particular player's crossing attribute or the capacity of a stadium. On the other hand, others may want to get a bit more involved and create their own team from scratch, or really get stuck in and create their own competition (European Super League anyone?). The sky really is the limit when it comes to editing the mountain of data that comes with FM. Unfortunately, I can't possibly cover every possible combination and permutation, however once you get used to the editor and how it works you'll soon discover that although the fields that you can edit are numerous, the principle remains virtually the same. The first and most important thing that you need is.... what did you shout out there? the editor? well, yes, that is pretty crucial... but it's worthless without your ideas. What you really need first is to decide what you want to do. For this example, I want a scenario which allows me to show a number of different parts of the editor. My scenario is therefore this.... I'm a billionaire who makes Bill Gates look like a pauper. I've retired from my international 'widget' manufacturing business and am in need of a new challenge. Being a fan of Newcastle United, I am utterly appalled at the way the club has been mismanaged in recent years so I phone Mike Ashley and ask him how much he wants for his toy. WHAT? No sale!!! At any price?? Oooooo that makes me mad!! Right, I'll show him. I'll create my own alternative Newcastle club and fund it to the top. AFC Wimbledon, FC United, it's been done with decent success before but with my gigantic bank balance we can really shake the foundations of English football, AND I’m arrogant enough to believe that I’m the best manager for the team too. So, I'm going to create a new club, put it into the bottom of the English league structure, build it a new stadium, give birth to a new Chairman (not literally), set up the finances, and the fun part.... create a new set of strips! I might be easily pleased but I love creating strips, hehe. Voila! It's now installing in the background. Once it's installed, there should be a shortcut on your desktop. It's a grey version of the FM12 icon. Fire her up! Don't be alarmed if nothing happens for a few seconds, it does tend to take a little while to load up, even on high end machines. Usually when you're about to edit data type stuff it's a good idea to backup the original database. However, those clever folks at SI have come up with a system of incremental xml update files. That basically means that you NEVER actually change anything on the database itself, so there's no need to back anything up. Instead, you can create as many of the edit xml files as you like then pick and choose which ones to apply to the database whenever you start a new game (certain common sense caveats apply, e.g. files that contain conflicting edits can’t possibly BOTH work at the same time). Anyway, don't worry about that now - we'll get onto loading the edit files into a new game much later. Drop down the 'Settings' menu from the menu bar in the top left hand side. Check that 'Currency' is set as you require it. I'm in Scotland so I set it to 'UK Pound Sterling'. Check that 'Language' is set as you require it. As SI hasn’t yet put in an 'English (Scottish dialect, ken)' option, I leave it at 'English'. Display Mode is next. This should have defaulted to your current desktop resolution but feel free to set it as you wish. Maximum Records For Search. I would strongly recommend that you leave this at 500 until you're confident with the Editor. There may well be times when you want more than 500 records returned, and you can change it here, but be warned that 'Unlimited' WILL hit your system hard if you do vague searches, you may want to have a fire extinguisher handy. Just kidding. The final option is 'Save Backup File'. Leave this ON. When you are editing, you should be saving your work often. This option will mean that the previous save will NOT be overwritten, but will instead be renamed with the suffix 'bak'. Very sensible. Drop the 'File' menu down in the top left hand side. The first option that isn't greyed out is 'Load Database...', so hit that. A progress bar will appear and the data will load up. I would recommend that you do this straightaway. Leave the folder location alone. If you change the location, then FM will NOT spot the file when you start a new game. Name your edit file and hit 'Save'. I'll call mine NewcastleCity. Click 'OK' on the resultant message box. From now on, you can either overwrite the file by selecting 'Save Editor Data' (remember the old file will be renamed to a .bak file in case you mess things up), or you can be really careful by saving the file with an incremental number at the end of the name every now and again using the process above. You should now see that the left hand side of the Editor window looks as above. You'll soon pick up how it works. Let's do a few searches to see how it works. Example of searching for England's Newcastle United. Almost halfway down that left hand side you'll see 'Database' in big, slightly blueish writing. Beneath that is a list of data areas that you can search within. Check that 'Clubs' is highlighted in red. Enter 'Newcastle United' into the text area and hit Enter. The search should return three results. It's fairly obvious which is the one we're after as it says 'England' in the Nation column, however let's try customising the filter to try it out. Just to the left of where we typed 'Newcastle United' is a big grey 'Filter' button. Click this and you'll see that three options appear. Now you can edit your search filter. Click 'Add Condition' and select 'Nation'. The principle is exactly the same as searching inside the game, so you should be used to it. Enter 'England' into text area. It should now look as below. Click 'OK'. And, as if by magic, the club we're looking for appears. Double click the resultant record and the ‘Details’ for Newcastle United appear. As I've said, searches and filtering in the editor all use a similar principle to searches within the game itself. Easy stuff. One final thing. You may notice that the left hand side of the Editor has now changed to reflect the fact that a club's details are being shown. We now see that 'Details' is selected in red and under it are things like 'Stadium', 'Finances', Competitions' etc. Pretty much the same as in game, the Editor is splitting the data held into areas of interest. If you select 'Stadium' then you'll see that the stadium information appears and is sub divided into four different tabs of fields on the right hand side. That's basically how navigation works in the Editor. Once you get used to the way of navigating around, then you'll find that all data is found, retrieved and displayed in much the same way. Underneath the 'File' menu in the very top left, you'll see a grey panel entitled ‘Menu’ with ‘File’, ‘Database’ and ‘Newcastle’ listed in that order. This is our 'top down' view of the data. We need the Database level so click Database. You'll now see that we're right back to where we started our search example above. In the lower half of the left hand side of the screen we should see that 'Clubs' is once again highlighted in red, if not click it now. Now look in the bottom right hand corner of the screen. You'll see four buttons 'Add', 'Edit', 'Duplicate', and 'Remove'. We want to create a brand new club so click 'Add'. Anyway, back on topic.... I can't possibly go through every individual field here, there's waaay too many, so I've screenshotted (screenshotted? Is that a word…. Well, it is now) each of the screens edited and placed them in this folder. Any areas/tabs that are NOT in this folder means that I have NOT touched them (for example, ‘stadium - supporter bans’, give them a chance! we haven't even built a stadium for them to riot inside yet). There’s also a rar file there containing all the screenshots. For instance, the stadium & the chairman. To add a new stadium/person, the principle is the same as we went through earlier for the club. Let's quickly add a new stadium as an example. Underneath the 'File' menu in the very top left, you'll see a grey panel entitled Menu. Click 'Database' in this panel. When you're using a few entities that you've searched for as examples, you'll be constantly switching between them to see what data they've got. How do you easily switch without searching from scratch? Easy, see that dropdown on the left hand side with a 'Clear' button next to it? If you select that, you will see a drop down containing recently loaded data items. Just select the appropriate one to switch across to it. In my example of Newcastle City, I've invested a total of £3 billion of my enormous fortune into the club. £500 million of that is available for the building of the new stadium and for paying off council officials....errrr I mean securing planning permission. The architects tell me that they propose that we don't build a 125,000 all seater stadium with retractable roof from the outset, as this might be overkill for our first few seasons climbing out of non league football. So we can build a nice 25,000 seater stadium with room to expand when it's required. The initial cost is £150 million. This leaves £350 million for the club's bank account with the remaining £2.5 billion invested to generate future income. So, how do I show this in game?? I create a 25,000 all seater stadium on the town moor (see latitude and longitude on the stadium screenshot) with an expansion capacity of 125,000. The £2.5 billion, I've estimated will generate a nice annual income for the club of £130,000,000. If you look at the 'Other Income' tab of the clubs finances, you can see that I've added an item with 'Income Type' of 'Other Income' and an amount of £260,000,000. Hmmm hang on a minute, that's double the annual income isn't it? Yep, trial, error and experience have shown me that the best way to get a lump sum paid into the finances every year is to set it up so that it's across two years and the game will then pay half each year. I tried it as a single payment, but it wouldn't renew for some reason. If anyone has a better way of achieving this idea then please let me know!! :-) Finally, I set the bank balance to £350 million, BUT it no longer allows you to do this if your club has a low stature/no sugar daddy. I like a lowish stature, because I want to build it up over time, and I don't set a sugar daddy because I like to manually set the payments into the club. Even if you set the balance to something like £100 million (as I’ve done), you'll notice that when you start the new game, you won't have anything like that amount. That's because the game overrides your balance with an amount befitting a club of your stature. Soooo, I sort this out by starting the game and then using a save game editor such as the excellent Bracasoft one (Hi Ruci!) to set the initial bank balance. After that, the income payment that I’ve set up kicks in, and it all takes care of itself. This is a hot topic at the moment. I heard Howard Wilkinson on the radio the other week advocating the use of Spain style feeder teams in England. In my example, I've added Berwick Rangers as an affiliated club and then made them into my B team. This means that instead of a reserve side, I use Berwick Rangers. I've boosted the stats of Berwick’s training facilities, and improved the stadium a bit to indicate that I've pumped a bit of money in as part of the deal to buy them out. The first time I tried this, Berwick went bust! This was because I was putting highly paid players in their ranks, and they couldn't afford the wages. So now, I put £5 million a year into the club as part of the deal to offset the wage costs. 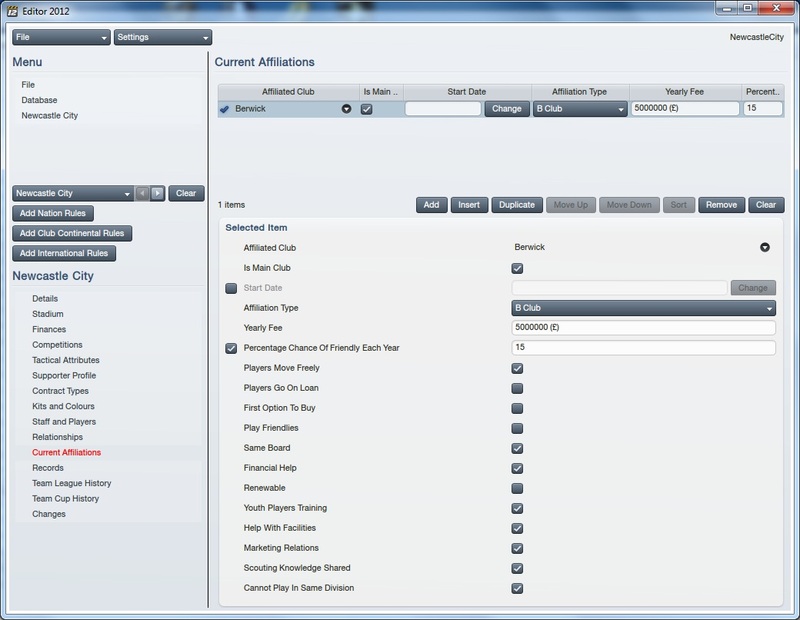 This is a new page of fields that's appeared in the FM12 editor. As such I'm not 100% sure exactly how they affect the game but I'm pretty sure that they'll just follow some common sense rules. I'll discuss them here but please remember that at the moment i have NO official explanation and therefore this is pure speculation on my part. It would be great if an SI data hamster was to pop in and give a thumbs up or thumbs down at some point, but as we know they are very busy running around on their wheels at the moment given that the game came out last week. There are only five fields here. Loyalty, passion, patience, affluence and temperament. It's fairly obvious what each one refers to, but what we're interested in is what effect will putting in different values have in the actual game. As always, when I come across a new field I have a look at some examples. I've put a small table together of a few club's values below. Apparently I've hit a wall on the number of images I'm allowed to show, so you'll need to open this in a new browser if you want to look at it whilst we discuss the fields. The first thing we see is that the American data hamster is probably hibernating. WAKE UP and stop leaving your club's values at default! Let's ignore the two American clubs from now on, as they are purely an example of leaving the fields at 10 if you don't know what to set them to. Ok, let's have a look at each field and SPECULATE on what effect it might have. Attendances during a bad run, or after relegation. Season ticket sales after a poor season, or after relegation. A minor influence on 'Fan Confidence'. The confidence is less likely to nosedive if they are loyal, but I would think that patience is more important in this regard. Attendances could be boosted with high passion. This might even override a low affluence setting to some degree. If people in a poor area love their football, then they'll save the money and go to the game even if it's expensive. Big home matches, local derby games, cup games etc. The players confidence will be boosted by their passionate fans getting behind them. Looking at the examples, we can see that (according to the database) Chelsea fans have their hearts surgically removed at birth, whilst Accrington Stanley and FC United fans love their clubs more than life itself. The obvious one here is that a low patience will mean that fan confidence in you will disappear quickly if you go on a run of defeats. During matches, if a particular player(s) or the team are not performing, the fans may start to get on their backs and make them less confident and more nervous if they have low patience. A high patience will obviously have the opposite effects. Another glance at the table above tells us that Accrington fans will give the manager all the time in the world to build a team and find success, whilst Millwall fans will be calling for your head after a short run of defeats. Money, money, money. How much disposable income is there in your club's catchment area? High affluence means that fans will be willing to pay a high ticket price and merchandising and corporate income will be high. Low affluence will negatively affect shirt sales and wll lower season ticket sales and attendances at less important matches. As stated before, a high passion may well offset the negative effects of a low affluence rating. Once again, the examples give us an indication of this. Chck out the amount that Chelsea and Arsenal fans pay for season ticket prices, it's astronomical. Interesting one this. Until I drew up the chart of examples, I had assumed that a high temperament rating would mean that you fans had a good temperament, ie were less likely to start a fight over a spilt pint outside the ground. However, it's clearly the other way round. Millwall fans have been given a rating of three with Chelsea on five. Oh dear. Well, they do have a certain reputation. Barcelona and Arsenal on the other hand appear to have fans who are quite happy to buy a round of drinks for the opposition fans after the game. Bravo! So, a low rating means that your fans might go on a rampage after a defeat, causing possible fines or fan bans for the club. If your fans carry cards with the name of your club on followed by the word "headhunters", then you may want to put a rating of under five in. I added Newcastle City to the Blue Square Bet North division. However, this means that we have too many teams in that division. I’ve rectified this by arbitrarily removing another team. There were a few teams that looked to be on the verge of bankruptcy so I chose one of them. We've battered the Editor with our data and saved it away. Now the fruits of our endeavour are ripe for plucking. Start up FM12. After clicking 'Start New Game', you'll get a 'Choose Database' screen. At the bottom of that screen is 'Editor Data Files'. It should say '1 enabled (1 in total)'. If it says 0 then you've probably saved the XML file to a location other than the default location and you'll need to move it. On the other hand, if you've been a busy little data hamster and created multiple xml files, then tick the 'Change' option and you'll be able to select which of the Editor data files you want to use for this particular game. And that's it for now. The Editor essentially turns FM into a sandbox management game. You can create totally new scenarios and the only limit is your imagination. Rangers and Celtic move into the English Premier League? Try it! Dagenham and Redbridge get a billionaire sugar daddy? Try it! All new London Utd start in the Premier League with the worlds best players? Try it! East Stirlingshire get undersoil heating? Try.... errr well maybe not. Even if nobody ever reads this, or does read it and thinks it’s garbage then at least I’ve had a play with all the BB code tags, so I’m happy hehe. Thanks for this mate, gonna look in to creating a team or two when I get back on my computer now so really excited about that Also what I want to know is if you can update and change stadiums etc... can you customize the colours of the nets and the pitch patterns etc...? Because that would be awesome and I was just skimming through until I got back home otherwise I would be itching to do it like right now. very helpful on the fan temperament I was always confused about that one too, cheers mate! is it possible to register a new team and then play as them? great article. i followed the instructions, create an MLS club, retired an MLS club by setting it to extinct to keep the league at 18 teams. started a game, but about three game-weeks in, fm12 keeps crashing. does anyone else hav this problem? If the country is greyed out, that implies that you addded a club to a league and didn't remove a club from the league thereby exceeding the number of clubs in the league. You have to balance the league by removing a club or you won't be able to select the country. This worked a treat for me but the only problem i have,(other people have to) is that when i make a team up or change around with the data it will block me from picking the nation i done it in, E.G i made a new team called 'Coventry United' in the Npower league1 which is in the English leagues and every time i go to load up a new game i get to picking the nation i would like to manage in and every time it will be gray with like a 'warning' sign. so i would go to a Scottish/Walsh/Irish team and search 'Coventry United' and it will come up with all the player i added into it, all the staff i added, and the chairman! All i want is a solution to fix this so i can play with the team i made and how i know how to do it in future! Awesome! Awesome! Awesome! Just created my very own team, thanks to you. Hi, would be grateful for a reply. I have made my club, following the instructions provided, however in the new game setup, when I try and click to add England to coutries playable, it is grey and I can't click on it, yet my club has been created and if I type in the name into the search bar it's there. I would be grateful if you could tell me why this is happening and if there is a way to solve it. So basically I cannot play as my club, or any team in the same country as my club, yet it is still there? This has helped me hugely, thank you. Can I ask though, is temperament the same with players, e.g. having a rating of 20 means they will not go off the rails... Oh and the same for controversy with a player please. Hmm is there a way to edite the premiership rules so i can add a team? at the moment im deleting swansea but id like to keep them in. Also when i start a game all the money ive added in the editor has gone, instead of having no players and having 500mil to spend im left with 1mil to spend and 300k on wages and only 4 mil in my finances... why is that changing and how do i stop it? Great guide, thanks a lot! Like Evo, I never knew you could use a real team as your B team, and also I had no idea what the Supporter profile would affect- I think your reasoning is right. One thing though- I have made my new club and saved the editor data. But when I try to play the game as that club, with that database, I can't to select it- the Editor Data Profile button next to Choose Nations is greyed out. Am I missing something or is something going wrong? Amazingly well done guide mate! A great guide to the editor recoil and a much needed one. I wasn't aware that you could set a real team as your "B" like you have with Berwick and I now have an urge to create a game with a full team as my reserves (no more affiliating a Scottish club and exploiting the no limit foreign loans ). 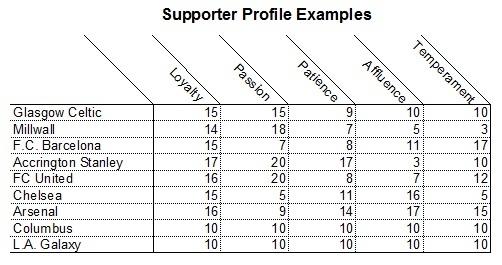 Also nice to you see your opinion on the supporter profile, I was wondering what those attributes could mean. Handcrafted in Symi, Hellas. Page created in 0.484 seconds.